Rhino Expandable Safety Barriers are a cost effective solution to prevent access to the factory floor. The sturdy steel and aluminium construction stands 950mm high and weighs only 13kg. This makes Rhino Expandable Safety Barriers completely portable. The Rhino Expandable Safety Barrier is only 375mm wide when in the closed position (making it easy to store), and the barrier stretches to a mighty 3.5m when fully expanded. 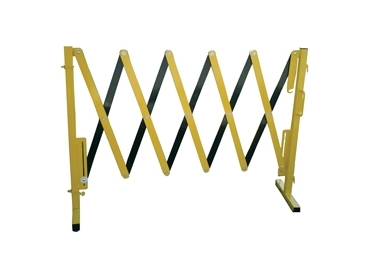 The Rhino Expandable Safety Barrier is available with attachments for signs, warning flags and flashing lamps. These attachments deliver increased visibility and safety. The Rhino Expandable Safety Barriers are ideal for directing pedestrian and forklift traffic away from hazards. The The Rhino Expandable Safety Barriers sturdy structure ensures a good investment with a product that has a long life. Australian Warehouse Solutions (AWS) has been providing safety solutions for over 30 years.